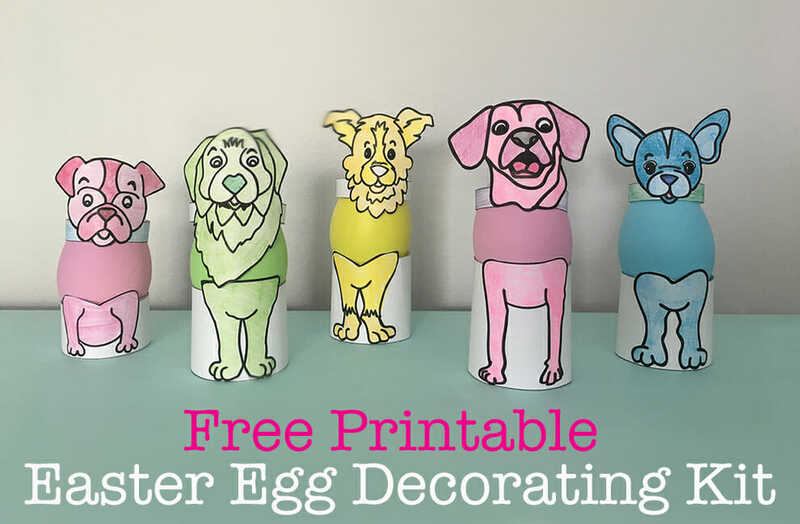 We are SO EXCITED to have Jessica Shipman of Beagles and Bargains joining us today with a ridiculously adorable DIY project for dog lovers. Who wouldn’t want to get this on Valentine’s Day? 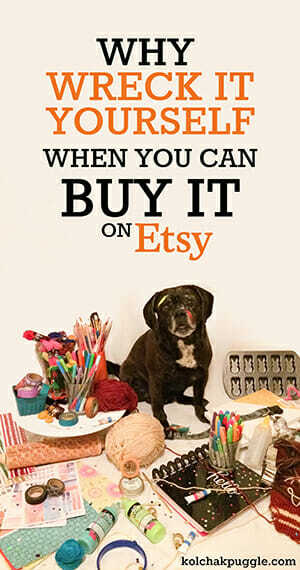 Make sure you visit Jessica’s blog or visit her on Facebook for more great DIYs, recipes and tips. I absolutely adore fresh flowers, but then again so does everyone else around Valentine’s Day. For some reason about this time in February, bouquets of roses and other beautiful buds suddenly more than double in cost. To beat the rising costs, I thought it might be fun to put together a bouquet that is equally as festive, but wouldn’t just die in a week or two. I find plastic flowers to be a bit tacky, so what other options are there? Little plush dogs, of course. I put together my Plush Dog Bouquet for less than $25 and the bulk of that cost was from the little plush dogs, which I picked up from Oriental Trading. If you already have some small stuffed animals laying around your house or can find some cheaper options at your local dollar store, then the cost will be minimal. 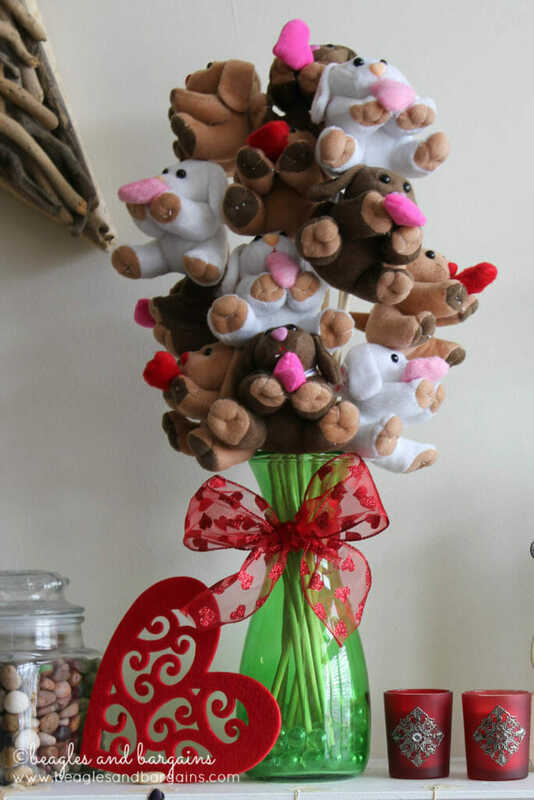 And any animals work of course, so you can personalize the bouquet with your Valentine’s favorites. Tie a ribbon around the neck (like a collar) of all the plush toys, if they don’t already have one. Skip this step if yours already have ribbon like mine did. Cut the dowel rods. 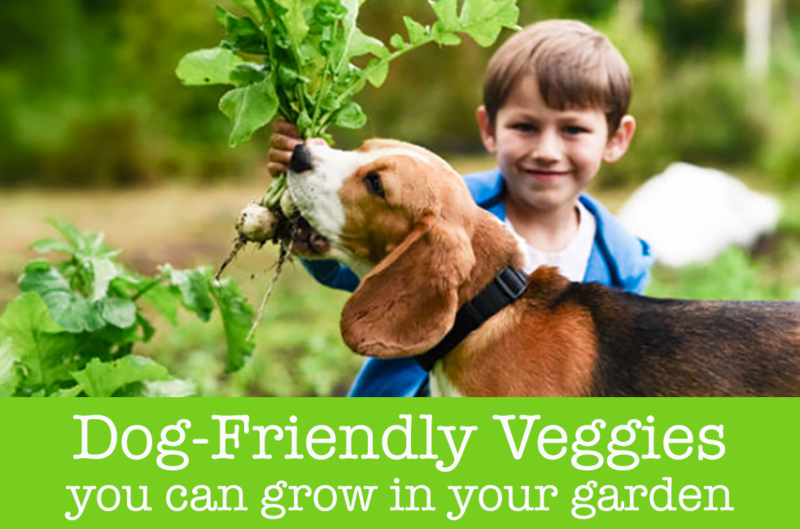 A saw or pair of garden sheers are probably the best tools to cut the rods, but if you don’t have those you can also use a pair of dog nail clippers. The edge won’t be perfectly smooth, but it gets the job done! You will want 12 individual rods at 4 different heights (3 for each). Cut the 3 shortest rods to be about two inches taller than your vase. My vase was about 10″, so the shortest rod was about 12″ long. Measure the height of your plush toys. Mine were about 4″ tall. Cut the next rod to be about 4″ (or the height of your toys) taller than the first rod. My second one was about 16″ tall. Repeat two more times to get 3 sticks at about 20″ and another 3 at about 24″. 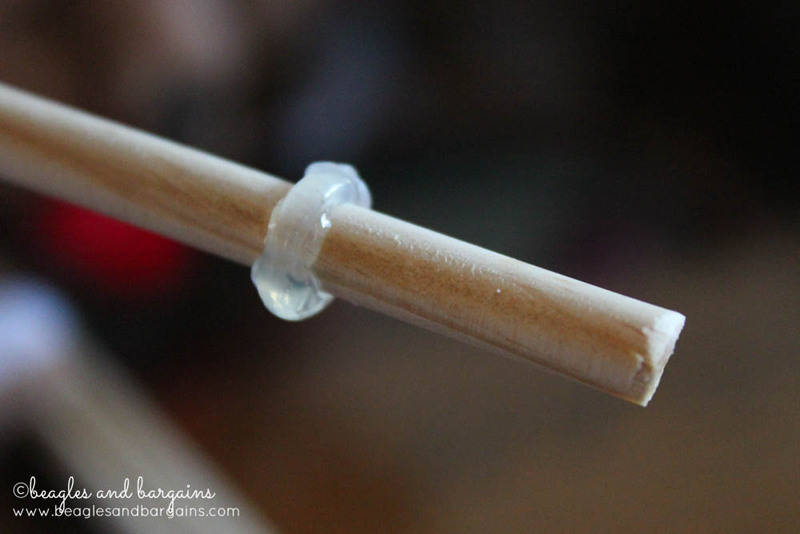 Add a circle of hot glue on each dowel rod about 1” down from the tip. This will keep the plush toy from sliding down the rod. Add more or less hot glue depending on how tight or loose your ribbon “collar” is or if they toys tend to rotate on the rod. Once the hot glue has dried, slip the rod through the ribbon “collar”, so that the ribbon rests just above your hot glue circle. Repeat until all your plushies are on a stick. 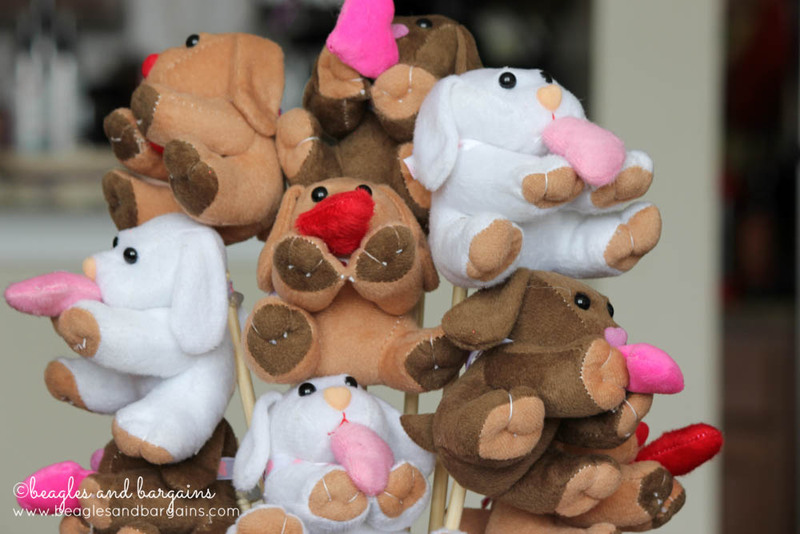 If you have a few different colors or types of plush toys, you might want to spread them out across the various dowel rod lengths. I decided to do one of each color at each height. Add your marbles or rocks to the bottom of your vase. The bouquet will be top heavy and this will help balance it out. 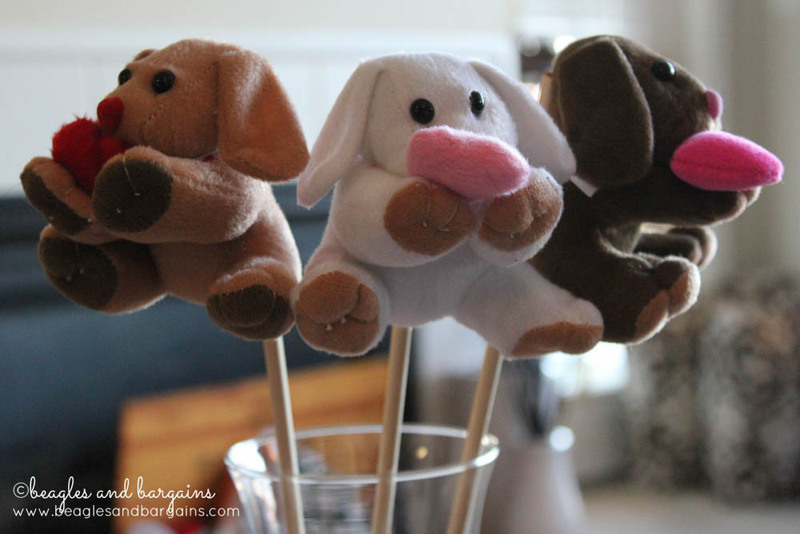 Place your plush toys with their sticks inside a vase. Start with the shorter sticks and work your way up, positioning them as if were cut flowers in a vase. 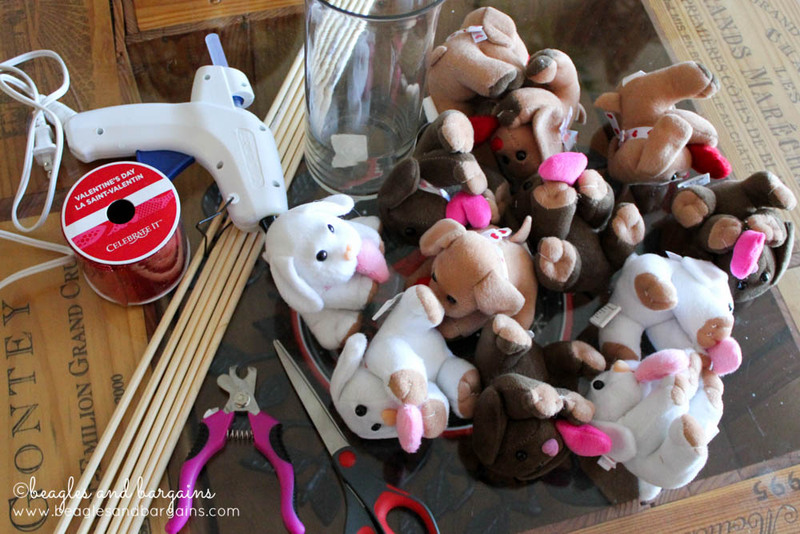 Once you have your stuffed animals arranged, add the final touch – tie a ribbon box around the vase. If you don’t have a vase you want to use, you can tie a ribbon around the bottom of the sticks and present it just like a bouquet of flowers before the vase. One last tip – try to find a vase that is narrow in the middle or at the top. It will help keep the individual pups on a stick from moving around too much. What kind of gifts are you crafting up this holiday? Thanks so much for featuring me and the dog bouquet! It was so fun to make and looks great on my mantel! That is so adorable! I could see myself giving this to my sissy Sarah or a pet loving friend. I love that it can be also adjusted to be small kitty toys for the cat lover in your life. Thank you for the easy step by step directions with photos.